NEW WORKSHOP DATES, HOLIDAY POP-UP SHOPPE & BAZAAR OF THE BIZARRE! If you were looking to create a unique Holiday gift or to give the gift of a unique experience, you’ve probably come to the right place. NOVEMBER 26 or 27 in TORONTO at 322 HARBORD ST.
We had such an amazing time up at PREHISTORIA, that we’ve decided to add a few new dates. DECEMBER 3rd or 4th if you are looking to create a unique custom gift. JANUARY 22nd or 23rd, 2017 if you are looking to treat yourself or someone else to a new learning experience. We are burying the year with an incredibly special date at RUE MORGUE MANOR! DECEMBER 10th, join us as we take over the board room of Canada’s Horror in Culture and Entertainment Empire for one of our anthropomorphic rat workshops. Gift certificates are available for those who wish to purchase a seat for someone else. If you are looking to purchase some of Teta Kika’s pieces, you can find them at the KRAMPUS KRAFT HOLIDAY POP-UP SHOPPE at 322 HARBORD STREET for the entire month of DECEMBER, where you will also find unique items from NEVERWARES, THE SPIDER AND FLY, and other local artisans. You’ll also be able to find TETA KIKA at the FROST BITE EDITION of the BAZAAR OF THE BIZARRE in Toronto on December 11th at THE PIA BOUMAN SCHOOL, 6 Noble Street, from noon to 8PM. NEW DATES ADDED & OPEN STUDIO! I am really bad about updating, and there is so much going on. I’ve added some new dates into late autumn, just in time to create unique holiday gifts. There are also still a couple of seats left for the OCTOBER 15th & 16th workshops. A bunch of autumn workshops have been added, and options for private lessons are currently open. We are looking to book some dates in cities around LONDON, MONTREAL, OTTAWA, NIAGARA FALLS for November and December, so if you know of a studio or shop, or simply a group of friends who would like to host, please get in touch! 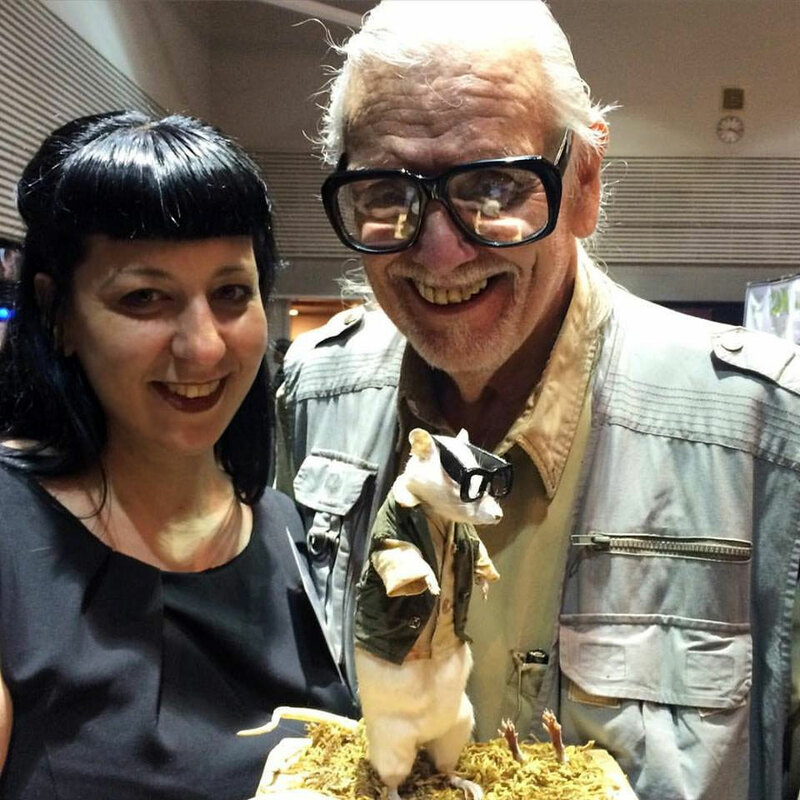 Recently, we attended RUE MORGUE’S inaugural DARK CARNIVAL EXPO in HAMILTON, ON where we had an incredibly fun weekend. We’ve already planned on going back for next year. Romero even stopped by our booth to meet Ratmero. ANTHROPOMORPHIC RAT seats have just been released for SEPTEMBER 17th & SEPTEMBER 18th in TORONTO. More Autumn dates will be added soon! The upcoming APRIL workshops are all filled up, but there are still seats left for TORONTO in MAY. 2016 DATES ADDED : A PERFECT GIFT! Treat yourself or a friend to a unique learning experience! I’ve just added a handful of new dates for 2016 at a special rate made for giving. Please let me know if you are purchasing as a gift so that I can send you a printable gift certificate. Thank you so much to FAN EXPO CANADA for having us, and for forcing me to get over some serious stage fright. It was a fun-filled weekend full of spectacular surprises. 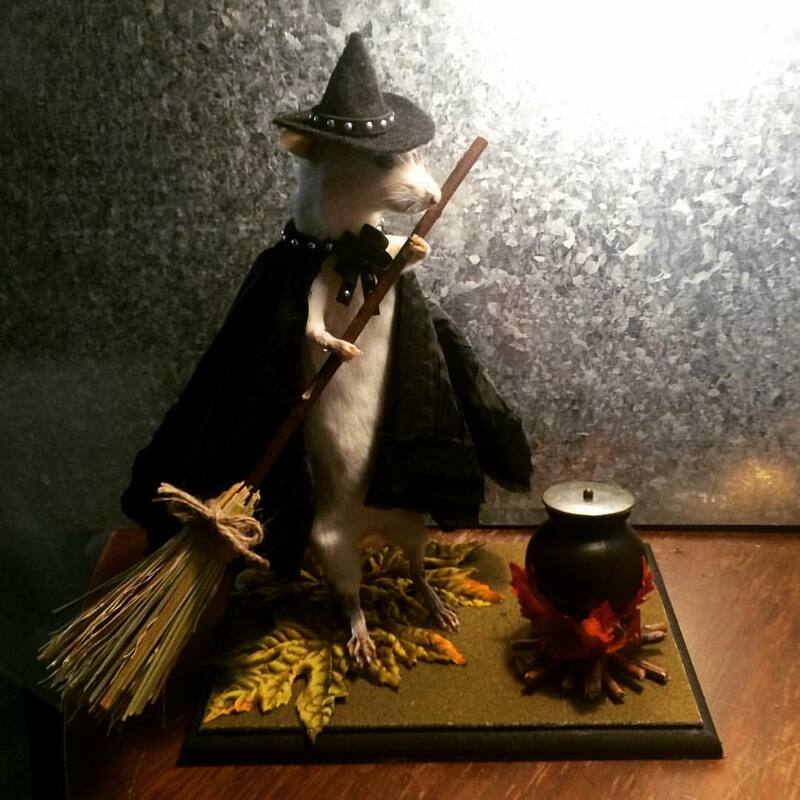 I’ve got some NEW TORONTO DATES posted, in time for those looking to create costumed Hallowe’en rats and unique holiday gifts. Thrilled to announce that CASUAL TAXIDERMY is listed as one of the FEATURED HORROR ATTRACTIONS at this years FAN EXPO CANADA from SEPTEMBER 3rd-6th. 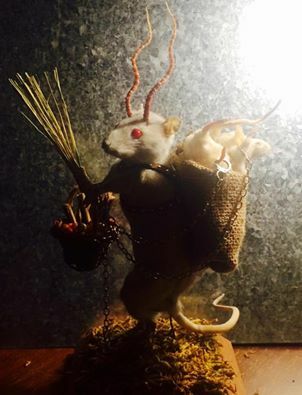 Join taxidermy artist and educator Ankixa Risk as she leads a discussion on the history of taxidermy from its roots as a method of preserving zoological specimens to the nineteenth-century fashion craze that literally changed the way we understand and interact with nature. Along the way, you’ll learn a little bit about anatomy, legal and ethical sourcing, and how to properly stuff and mount rodents. Not for the squeamish or Norman Bates impersonators. If you are attending, please drop by and say hello. HALIFAX was so much fun, can’t wait to go back! There is only ONE SEAT LEFT for Sunday JULY 12 in TORONTO, and Saturday, JULY 11 is starting to fill up as well. I’ve just added a couple of CLEVELAND DATES, AUGUST 22 & 23. LOOK FOR NEW DATES SOON!